How do I join the CSA? What CSA Share do I choose? How does the csa work? 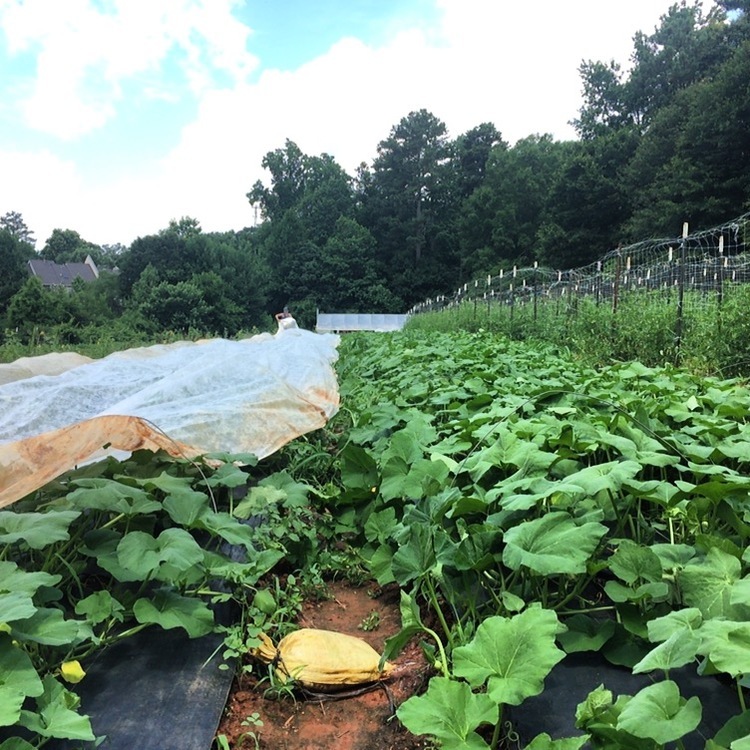 Our CSA seeks to facilitate a close relationship with our members, while providing a weekly share of the freshest and best food from our seasonal harvests. Choose the CSA Membership below that best fits you and you can sign up by paying in full or by downpayment online or by mailing a check via an invoice. We accept and double SNAP (aka EBT) through our partnership with Fresh for Less Georgia. If you are interested, please email joe@loveislovefarm.com. We also offer a few volunteering memberships (info is below). The cost of the 2019 Spring CSA Session for a FULL SHARE is $475 and members receive an average of 7 produce items weekly for 16 weeks beginning in early May. The cost of the Spring CSA Session for a HALF SHARE is $265 and members receive exactly one half of a full share for 16 weeks beginning in early May. This year we are excited to be able to accept and double SNAP (Supplemental Nutrition Assistance Program aka EBT) payments for CSA Shares, Egg Shares, and Frolona Meat Shares through our partnership with the Fresh for Less Georgia. Members using SNAP will be asked to swipe their EBT card every month for half of the total price of their share, effectively making $1 swiped = $2 in farm food. If you are interested in participating with SNAP or have any questions, please email Joe at joe@loveislovefarm.com. A full dozen eggs is distributed every other week during the Summer/Fall Session from our partner farms, Evie's Country Garden (Waco, GA) and Country Garden Farms (Newnan, GA). Neither farm is certified organic. The cost for the Egg Share is $52. Eggs are distributed every other week for a total of 8 distributions during the Spring Session. Frolona Farm raises grass-fed and finished beef and pastured pork in Franklin, GA. Meat Shares are distributed bi-weekly for a total of 8 deliveries (every other pick up) during each Spring Session. All meat comes frozen. Frolona offers two different shares. Frolona Farm is not certified organic. The Good Meat Share includes a rotation of grass-fed and finished ground beef, beef roasts, pastured pork sausage, and pork chops. The Premium Cuts Meat Share will include the delicious bi- weekly Good Meat Share plus premium cuts of grass-fed and finished steaks, pastured pork chops, and artisanal sausage links. The cost for the 2019 Spring Session Frolona Farm Good Meat Share is $137.50. The cost for the Frolona Farm Premium Cuts Meat Share is $275. We have a handful of volunteering member shares available during the CSA season. Most of our volunteering members help on the farm weekly, but we do have a few specialized opportunities to volunteer with the farm. We ask all volunteers to commit to a weekly volunteer schedule of 2 hours. As gratitude, we offer the full share CSA membership at the half share price. Please email joe@loveislovefarm.com if you are interested. Should I get a full share or half share? We really believe that the full share is the best representation of the abundance and diversity of what our farm and our partner farms offer, but we do also offer half shares to members that prefer it. All produce items for the full share are harvested with a full meal in mind. We also find that many of our CSA members prefer to share a CSA share and find sustainability in partnering with a family member, neighbor, or colleague. It becomes another valuable opportunity for community. How much food is in a weekly full share and half share? Our CSA share proportions look and feel different based on the season. In the spring and fall, the share is voluminous and in the summertime, it becomes quite dense. Full shares include an average of 7 different produce items in the share each week as well as Decimal Place goat cheese chevre occasionally. We strive to include an amount of each produce item that is sufficient enough for a meal or side for families with the possibility of leftovers and a meal or side for two with leftovers. Half shares are exactly one half of a full share. We also offer "seconds" of certain produce items for free to members as well as additional produce items for sale some weeks for folks that desire more of an item.